Receipts are a pain. Many business owners might even call them their nemesis. But however big of a headache receipts may cause you, they’re necessary for good recordkeeping and for lawfully deducting business expenses. But just how full should your shoebox of receipts be? Do you really need to keep every receipt? And for how long? And what happens if a receipt goes missing? If you don’t know the answers to these questions, you could end up in hot water with the IRS. Fortunately, we’re here to keep you in the clear by sharing three things you need to know about receipts as a small business owner. Repeat after us: It's better to be safe than sorry. 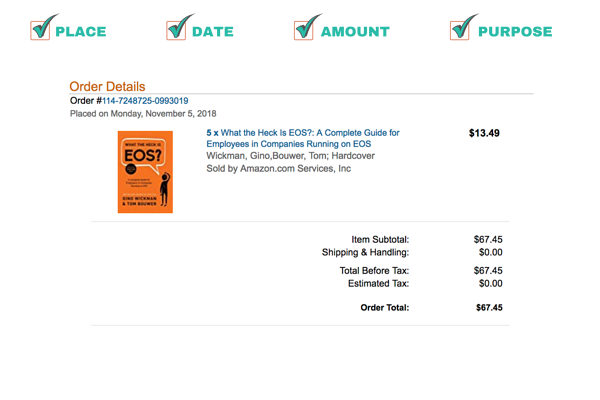 When debating whether or not you should keep a receipt, it’s always better to play it safe and err on the side of caution. There's much less harm in keeping a receipt you don't need than in tossing one you do. If you plan on writing off an expense on your taxes, you better be prepared to provide documentation that you made that purchase for your business. Proper receipts help demonstrate that an expense can be appropriately classified as a legitimate business expense. Should an expense come into question by the IRS, it is your responsibility as a business owner to prove its legitimacy. That burden falls on you and you alone. In most cases, the IRS considers documentary evidence—that is a proper receipt—as proof. But not just any receipt will do. A proper receipt that counts as documentary evidence of a business expense in the eyes of the IRS must include: 1) the transaction amount; 2) the name of the vendor or place where the transaction took place; 3) the date the transaction took place, and; 4) the nature of the expense. 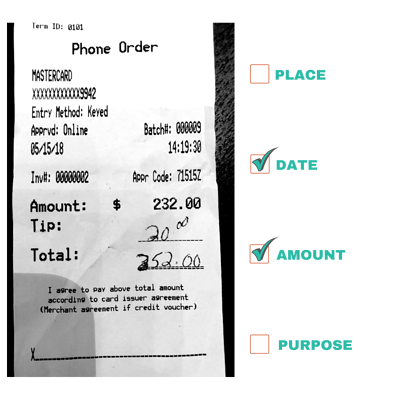 Most receipts include at least the amount, vendor name, and date, but not all receipts clearly show the nature of the expense. 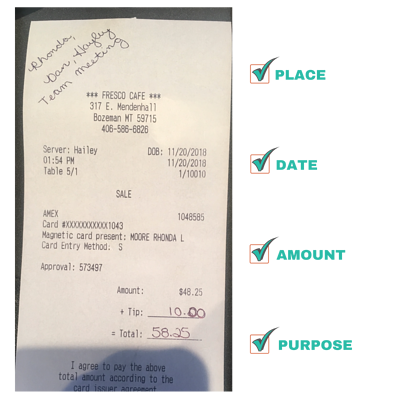 A handwritten note on the receipt is an acceptable method of documenting the purpose of the expense (see example below). There are also other ways to show the purpose of an expense. For example, a hotel bill for a business trip may not clearly show the nature of your stay, but it can be legitimized by your calendar. A credit card statement, however, is not considered an acceptable method for documenting the purpose of an expense. Online accounting software can help ease the burden of keeping receipts. 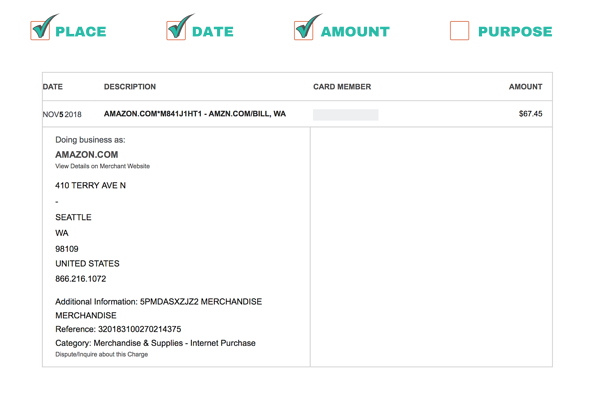 There are many receipt-organizing software programs that allow you to scan or take pictures of your receipts and upload them to a digital filing cabinet that will put your old shoebox to shame. HubDoc, Expensify, and Shoeboxed are just a few examples. Quickbooks Online allows you to attach a receipt directly to your expense, which makes finding a receipt for any given expense quick and easy. A proper receipt will not serve you in an audit if you can’t find it when needed. As helpful as software can be for organizing and storing receipts, you shouldn’t rely on it alone. You should always have a backup of your receipts. For example, if you use HubDoc, you should make use of the feature that automatically backs any uploaded receipts to a cloud storage system, like Google Drive or Dropbox. You may be wondering what happens if the IRS asks you to prove the legitimacy of an expense for which you didn’t keep a receipt. Without proper evidence, the IRS will likely determine the expense does not qualify as legitimate and will therefore disallow the deduction. A failure to keep records to support credits or deductions claims may constitute negligence in the eyes of the IRS. If the IRS believes your error was particularly egregious, they can assess a 20% (of the total understatement of tax) Negligence Penalty on top of the tax you already owe. The penalty for fraud is even greater at 75% of your tax liability. While it can be difficult to distinguish between fraud and negligence, fraud generally implies a deliberate act intended to help you evade taxes. Long story short: attempting to claim an undocumented expense can cost you big. So, as the new year approaches, take a few minutes to review your process for keeping receipts. Be sure you have the documentary evidence to prove the legitimacy of every business expense you plan to deduct from your taxes, and have a system in place that allows you to stay on top of your receipts. Having a process in place for keeping track of your receipts will help you avoid the mad hunt when it comes time to file your taxes. 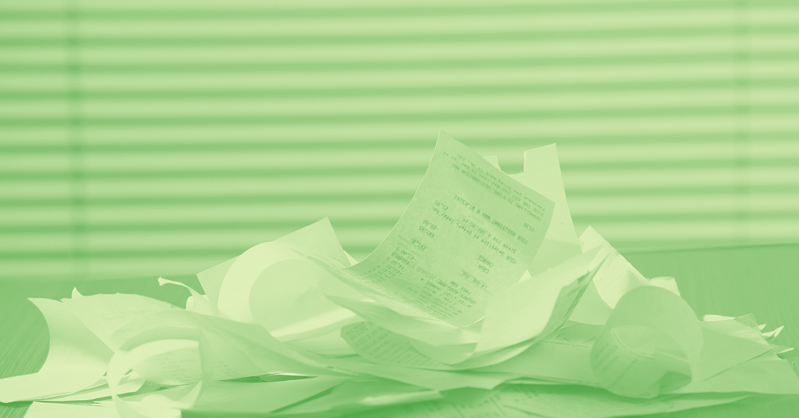 You have enough things to worry about as a business owner—don’t let receipts be one of them.